Are you available to locum in the captivating city of Melbourne? 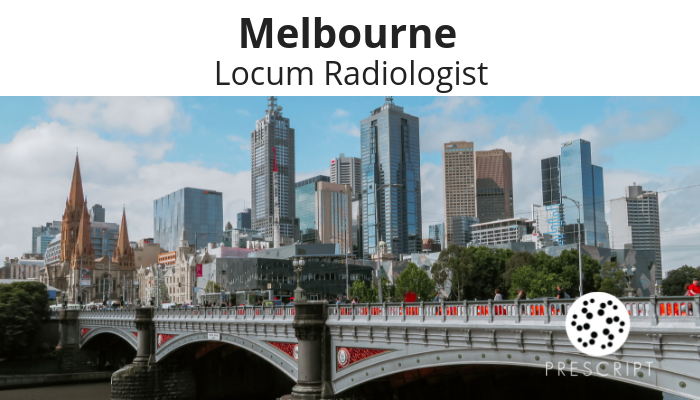 We have Radiologist locum weeks available across various Melbourne sites during June, July, September, October, November & December 2019 and January 2020. Why not enjoy a week or two in this vibrant and interesting city? During your time off you can explore all that Melbourne has to offer. For anyone who loves to wine, dine and explore the best in cafe culture, a visit to Melbourne is sure to leave you very well satisfied and planning your next trip back. As well as the culinary appeal, there are wonderful arts and cultural activities; cutting edge shows, sporting events, world-famous shopping, hidden laneways and vibrant markets. To find out more, call or email Nicola Speer (Prescript’s Senior Recruitment Partner for Radiology) – this location tends to fill up quickly! ✔️ Australian citizen/permanent resident or a New Zealand citizen. Contact Nicola Speer (Prescript’s Senior Recruitment Partner for Radiology) – Nicola is very happy to answer any questions. The first stage is an informal conversation with Prescript for you to decide if you want to proceed – you will need to share your CV and we will talk about the position, the company, and the location. You can let us know if you want to bring your family and if you have any special requirements. The second stage is an informal application – we will arrange a phone call or a review of your skills to establish if this is going to be a good fit. The fourth stage – Prescript will help manage all the paperwork and logistics. All you have to do is look forward to starting. Nicola Speer is Prescript’s Senior Recruitment Partner for Radiology with a focus on locum and permanent positions across Australia, New Zealand and globally. Nicola is very happy to answer your questions. ➕ Recruitment - James Hill, Nicola Speer, Rebecca Doyle, Marcia Beere - Dedicated recruitment partners focused solely on Consultant Radiologists. ➕ Marketing & Vacancies - Grace Clueit - Rapid promotion of locum, ongoing and teleradiology vacancies - helping Radiologists discover jobs with ease. ➕ Credentialing & Logistics - Stef McLaughlin and Lee Kabigting - Adhere to the highest JAS-ANZ-accredited standards of quality and credentialing. Management of paperwork and travel logistics - making sure doctors start on time. ➕ Finance & Payments - Hugo Scales - Prescript's Finance & Payments Manager ensures Radiologists get paid promptly and smoothly. At Prescript we’re known for helping solve the regional doctor shortage in Australia. Every day we’re focused on two clear outcomes - Helping hospitals find doctors that create departments and clinics that run better, have more capacity and less stress. And placing Doctors in jobs that leave them feeling highly valued, rewarded and, most importantly, enjoying what they do. We believe that when we get these two crucial things right, it has a huge impact on the regional doctor shortage and the healthcare of communities across Australia. Radiologists, would you like to experience Melbourne and its quirky, sophisticated charm? Always wanted to experience living in the sophisticated city of Melbourne? A private organisation based in Melbourne would like to welcome a Radiologist to their supportive and patient-focused team. A leading diagnostic imaging provider is undergoing a further period of expansion and is, therefore, seeking a Consultant Radiologist to work in one or some of their Melbourne clinics. The role could entail working across 2 sites (within a close distance to each other), as the sole Radiologist onsite. Part-time applicants who can commit to 0.4FTE or more will also be considered. If you're interested in a full-time or part-time private clinic-based role in Melbourne, please read the criteria below to see if it's the right role for you. ✔️ You will need to have General Radiology skills – CT, basic interventional, US (incl. MSK) and X-ray. Mammography skills, or a desire to learn these skills, would be highly regarded. ✔️ You will be committed to prompt, empathetic and professional care of patients. ✔️ You will be able to establish and maintain effective working relationships with fellow radiologists, physicians and other employees. ✔️ FRANZCR and AHPRA Specialist Registration. DWS applicants are not eligible for most sites. If you hold MRI Fellowship, you will also have access to reporting for MRI cases. This large and leading diagnostic imaging provider led by sub-speciality trained radiologists provides you with comprehensive diagnostic support across all imaging modalities. The organisation has been operating for over ten years, with expansion across a number of states due to excellence in service provided by their well-supported employees. A strong education program is provided, including continuing professional development available through in-house education. Fellowship programs in US and MRI are also available. Should you like to get involved in the Medical Advisory Committee and other modality committees, there is the ability to do so within the organisation. This company has partnerships in both the health and educational spheres. They are also involved in many research projects including Artificial Intelligence and developing deep learning solutions in radiology. Melburnians' reputed obsession with good food and coffee appears to be true - that's said as a compliment and with great admiration. For anyone who loves to wine, dine and explore the best in cafe culture, a visit to Melbourne is sure to leave you very well satisfied and planning your next trip back. As well as the culinary appeal, there are wonderful arts and cultural activities; cutting-edge shows, sporting events, world-famous shopping, hidden laneways and vibrant markets, plus the simple pleasure of walking around a very pretty city taking in the old and new architecture and absorbing some of the history in the layers of this city - Australia's second most populous. There's so much to see and enjoy in Melbourne. Melbourne is a very easily navigable city. Perfect for walking around the compact grid which makes up the city centre. The quintessential Melbourne Trams are free to hop on and off within the main city grid borders which makes it simple and fast to traverse the trips you may wish to take on your exploration. It's also a perfect (almost flat) city centre to walk around - this is the very best way to discover the hidden laneways, one of Melbourne's most engaging features. To take trams or buses or trains outside the CBD city circle grid, simply pick up a Myki card, and you're off. There is the chance to explore the city and perhaps further afield too. There are stunning wineries in areas including the Yarra Valley and Mornington Peninsula and the chance to stop in some lovely country towns to enjoy a tranquil lunch and take in some Australian country history - perhaps take a drive to the Dandenong or Macedon Ranges. There are incredible coastlines to explore close to Melbourne too. If you want to add a few memorable days on to a trip to Victoria, you can include the Great Ocean Road, an Australian National Heritage listed stretch of road, of approximately 240km that runs along the south-eastern coast of Australia between the Victorian cities of Torquay and Allansford. Do you enjoy working in a professional, yet compassionate environment? Does working for a large diagnostic provider, and the career opportunities it provides you, seem attractive to you? Contact Rebecca Doyle (Prescript’s Senior Recruitment Partner for Radiology) – Rebecca is very happy to answer any questions. Click ‘Candidate Contact’ to ask a question online (with option to upload your CV). Nothing is booked until you 100% happy. At Prescript Recruitment, we follow a transparent, friendly process to assist you with your new role. This begins with an informal conversation with Prescript – We will talk about the position, the company and the location in more detail and gain a clear understanding of your career, family and lifestyle wishes. From there, if you’re happy to proceed to the next step, we will arrange informal and more formal interviews and potentially a visit to make sure it is going to be the right place for you and your family. The final stage is progressing to your formal offer of employment which then secures you the role. We continue to look after you and ensure your move and start to your new position is smooth and stress-free. Rebecca Doyle is Prescript’s Senior Recruitment Partner for Radiology with a focus on locum and permanent positions across Australia, New Zealand and globally. Rebecca is very happy to answer your questions. ➕ Recruitment - James Hill, Nicola Speer and Rebecca Doyle - Dedicated recruitment partners focused solely on Consultant Radiologists. Discover local wines at welcoming cellar doors around the Mildura region. Meet the winemakers and hear about how they make their wines using state of the art techniques and equipment or traditional practices. As well as serving up great wines for you to sample and enjoy, some cellar doors and wineries run restaurants in beautiful surroundings and host musical and gourmet events. Varieties - Chardonnay, Shiraz, Cabernet Sauvignon and Merlot. Board a historic paddleboat for a river cruise. Once an important trading route, the Murray River was busy with boats carrying wool from the region's stations and homesteads. Did you know there are over one million hectares of national parks around the Mildura region? Pink Lakes - spectacular colours – click to read why it is has been given its name! Visit the World Heritage Mungo National Park, home of the famous Mungo Lady and Mungo Man, and explore a place rich in Aboriginal history. See more - click here for the Visit Mildura list of other parks to visit. Discover Mildura are organisers of day trips in and around Mildura. Run by locals who can help you explore the Mungo National Park, explain the local history with heritage trails and show off the best of the food and wine available. Wide variety of choice available – from camping to luxury options and everything in-between (you can also sleep on a houseboat as you glide down the river!). Click here for Visit Mildura's list of options. Mildura is on the border of New South Wales and Victoria as well as being less than a 90 minute drive from South Australia. Well connected with flights from Sydney, Adelaide and Melbourne. KEEN TO WORK IN MILDURA? Prescript can help great doctors find great places to work in both locum and permanent positions. Call us on 1300 755 498 or email contact@prescript.com.au - we'd love to hear from you. Alternatively, click on the button below to 'register as a candidate', 'subscribe for updates' or 'request a call'. Prescript are medical recruitment specialists. Would you like to enjoy the delights of Melbourne’s fantastic lifestyle whilst locuming at the same time? Prescript has dates available from now to March 2019. The role can be split into weekly blocks. As well as the culinary appeal, there are wonderful arts and cultural activities; cutting edge shows, sporting events, world famous shopping, hidden laneways and vibrant markets, plus the simple pleasure of walking around a very pretty city, taking in the old and new architecture and absorbing some of the history in the layers of this city - Australia's second most populous. We also have a locum role in Mildura which can either be weekly blocks or 2 days per week FIFO from Melbourne. Please touch base should that be of interest. Please contact me asap if you'd like to learn more - this location tends to fill up very quickly! Weekly/Monthly blocks - Now through to March 2019 - let us know is you are only available one of the weeks, and we will try and tailor something just for you. You will have your FRANZCR and AHPRA specialist registration. You must be an Australian citizen/permanent resident or a New Zealand citizen. Contact Rebecca Doyle (Prescript’s Senior Recruitment Partner for Radiology) – we are very happy to answer any questions. Click 'Candidate Contact' to ask a question online (with option to upload your CV). Nothing is booked until you 100% happy. Rebecca recruits for locum and permanent positions across regional Australia with a focus on Radiology. 📌Recruitment - James Hill, Nicola Speer and Rebecca Doyle - Dedicated recruitment partners focused solely on Consultant Radiologists. 📌Marketing & Vacancies - Grace Clueit - Rapid promotion of locum, ongoing and teleradiology vacancies to the broadest, relevant audience. 📌Credentialing & Logistics - Stef McLaughlin - Adhere to the highest JAS-ANZ-accredited standards of quality and credentialing. Management of travel logisitics. 📌Finance & Payments - Hugo Scales - Prescript's Finance & Payments Manager ensures smooth payment processes. Have you thought of a locum in beautiful country Victoria? Prescript has dates available in the charming city of Horsham from the 10th September to 21st September 2018 (can split into weekly blocks). It is mandatory that you can do PICC, CT and ultrasound. Horsham is a lively city located centrally in the Wimmera region and has a excellent reputation for farm to table dining, boutique shopping, quaint accommodation and fun entertainment. From golfing adventures to funky art galleries, there's plenty to explore in Horsham. Horsham has beautiful well-kept parks and an enchanting Botanic Gardens. During your time off you could try the wineries or stroll along the banks of the Wimmera River. You will be paid $3000 per day + GST. Flights reimbursed, car provided and self-contained accommodation provided. You will need to provide your own indemnity. 10th September to 21st September 2018 – let us know is you are only available one of the weeks, and we will try and tailor something just for you. Our credentialing manager, Stef McLaughlin, will help manage all the paperwork and logistics. All you have to do is let us know when you are free. Would you like to hear about other location options for radiology locums too? Talk to Prescript Recruitment for a professional overview of clinical details, practice/hospital, locations, rates and inclusions. It is mandatory that you can do PICC, CT and ultrasound. You can apply via this website or you can contact me (Rebecca Doyle) at Prescript Recruitment - rebecca@prescript.com.au // 0434 401 379 – very happy to answer any questions. You'll find information about our locum and permanent recruitment services for doctors, hospitals and practices. You'll also find links to our blogs, location reports and other resources. Prescript Recruitment is working with a base hospital in regional Victoria to find a PGY3+ Basic Physician Trainee. You will ideally have Provisional, Limited or General registration with AHPRA. An accredited hospital with the Royal Australasian College of Physicians, this role is suited to PGY3+ doctors looking to contribute to a regional community, whilst developing their Physician skills. Working in an acute care setting, you will be able to competently provide advanced life support and deliver general medical care to patients. Your new hospital is a 165-bed level 1 tertiary teaching hospital which provides public hospital services including Emergency, Maternity, Intensive Care, General Medicine, Surgery, Oncology, Medical Imaging and Mental Health. The hospital is affiliated with Monash and La Trobe Universities and provides undergraduate and postgraduate Medical education, clinical placement and training. Your new home town is a pleasant oasis sitting near the borders of VIC, NSW and SA. It’s a modern city with an interesting history. There are plenty of beautiful art deco buildings on show, not to mention some of the best dining in regional Victoria. Adelaide is also just a 4.5 hour drive, meaning you can explore the beautiful South Australia and it's famous wineries during your spare time. You'll be located just a short drive from the city, there are national parks to explore, and the great Murray River provides endless activities for you and the family. Picture yourself fishing, swimming, taking a houseboat away for the weekend or perhaps just enjoying a game of golf with river views. If you currently hold provisional, limited or general registration with AHPRA, please get in touch with Marcia Beere - 0416 544 788 // marcia@prescript.com.au to find out more. 1. This begins with an informal conversation with Prescript – We will talk about the position, the company and the location in more detail and gain a clear understanding of your career, family and lifestyle wishes. 2. From there, if you’re happy to proceed to the next step, we will arrange informal and more formal interviews and potentially a visit to make sure it is going to be the right place for you and your family. 3. The final stage is progressing to your formal offer of employment which then secures you the role. We continue to look after you and ensure your move and start to your new position is smooth and stress-free. Marcia recruits for locum and permanent positions across regional Australia with a focus on Medicine and O&G. Prescript Recruitment is working with a base hospital in regional Victoria to find an Advanced Trainee - General Medicine to join their growing department. You will ideally have Provisional, Limited or General registration with AHPRA. This is a great opportunity to gain valuable and advantageous experience within a small regional facility and will help prepare you for that next step in your General Medical career.